Labor Undersecretary Bernard Olalia, POEA Officer-in-Charge talked about new opportunities for the Overseas Filipino Workers in China and Japan. He also discussed about the agreements made between countries that will open new opportunities the OFWs during a video interview with Rappler. "Presently, we have this government-to-government framework with respect to deployment of our Filipino Overseas Workers in the Japanese government. we have this framework called JPEPA or the Philippine-Japanese Economic Partnership Agreement. Under this framework, Filipino caregivers and nurses are deployed to Japan after they passed the licensure and nursing examinations, but this framework is very, very much restrictive. So, apart from this government-to-government framework, we have a new framework that has only been passed last November 2016 in Japan and they ammended their recruitment laws. It will be effective this November of 2017," Olalia said. According to him, under this new framework, they have Technical Internship Training Program (TITP) which will allow hiring of Filipino assistant caregivers, skilled, semi-skilled and low skilled workers. Olalia also said that Japan realized that they need more health workers in their country due to growing population of aging citizens. From 2009 to date, the Philippines has sent only 1,909 care workers, nurses and caregivers, out of many applicants that went to Japan, only 282 of them passed to their very restrictive examination. This brought them to the realization and came up with the new framework which is TITP. Under the previous JPEPA framework, the careworkers need to udergo six months of intensive training in the Philippines afterwich they also need to complete another six months of training in Japan. Under TITP, there will be no need to undergo trainings in the Philippines and the examinations are made easier so that everyone can easily pass. In terms of recruitment, the private recruitment agencies are excluded from sending OFWs to Japan, however, under TITP, all licensed private recruitment agencies will be allowed to participate. once the workers are selected, they will undergo internship program in Japan, no trainings will be needed in the Philippines. While they are doing the internship, they will be allowed to look for jobs with commensurate salary. So they can already earn while undergoing internship. Olalia clarified that the new framework is now still being in the process of being studied. The exact requirements and framework could be determine during the signing of memorandum of understanding. Olalia said that it will surely be less restrictive compared to the existing JPEPA framework. In China, there are also job opportunities for semi-skilled, skilled and health workers. For household service workers, there are parties who inquired for this opportunity but at the moment, there are no doors for our HSWs to work there yet. Olalia also mentioned other opportunities for the deployment of OFWs in our neighboring ASEAN countries, Middle East, European and even available opportunities in the U.S.
About the policy on direct hiring, Olalia said that the Philippine government wants to protect every Filipino that are leaving the country for work overseas. Olalia reiterated the risks of direct hires or being deployed without a private recruitment agencies( PRA). He said that it will be difficult for the government to track the OFWs and ensure their welfare and safety without PRAs. 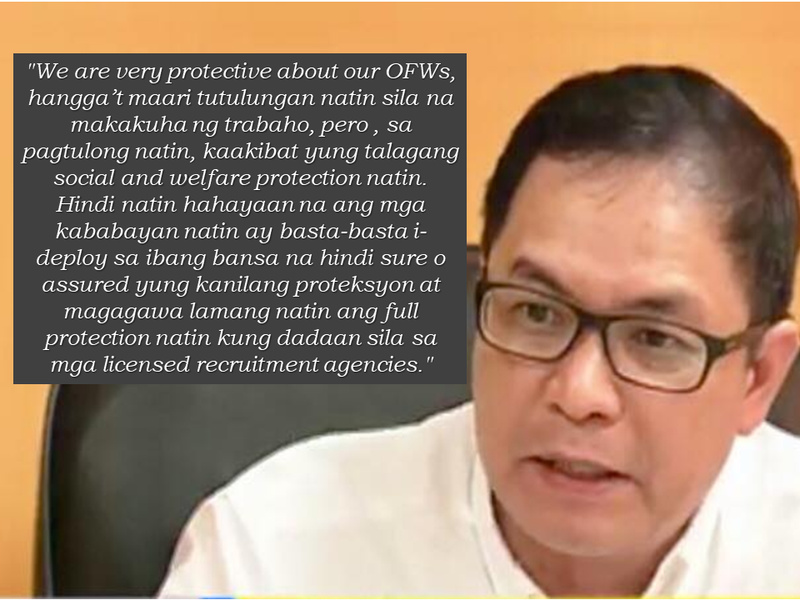 About the OFW ID or the iDOLE, Olalia said that they had been meeting with the stake holders and hopefully they will be releasing the guidelines. The big issue about the iDOLE is that who shall bear the cost and they are trying to come up with a resolution the soonest time possible. Meanwhile as our economy continues to grow positively, NEDA has released a project to make the common citizen understand how our economy fared well during the administration of President Rodrigo Duterte. They called it "Tunog ng Progresso" which is a part of making the common Filipinos informed on how our economy performs. a group of expert musicians, composers and musical arrangers worked together in this project. The most amazing thing is that they used the graphs as their base line to come up with a melody and rhythm that made up this song. 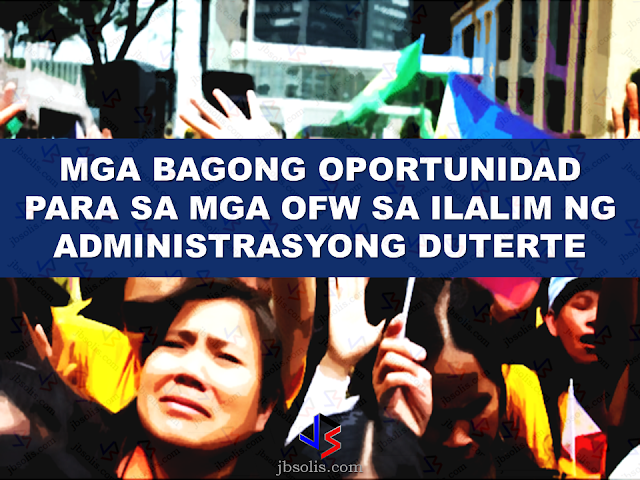 As opportunities for our OFWs continue to widen, it will greatly help our economy as it always does. Progress will soar and hit the high notes as we continue to dream bigger.